If, like us, you've spent 1000% more of your time outdoors in the past few weeks to celebrate spring, you'll be itching to ramp up both your hijinks and your method of recording them. The action cam industry knows this which is why we've already seen exciting, new devices from Garmin this week and an announcement from Panasonic too. The HX-A1 looks to be a bit of a compact hero, weighing just 45g (next to the GoPro Hero4's 89g camera-only weight) and coming in a tiny cylindrical form factor to maximise shooting situations. It's a rugged little machine, too - waterproof to 1.5m without the need for extra housing, shockproof to 1.5m, dustproof and even freezeproof down to minus 10 degrees C. Chances are you will drop before the HX-A1 does, then. 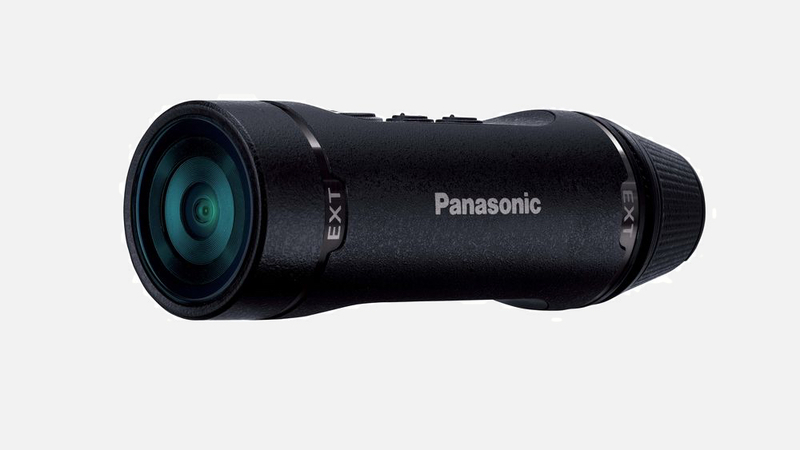 It captures footage up to Full HD and has a slow motion mode capable of shooting 60fps at 720p or 120fps at 480p. So it's no GoPro killer in the resolution stakes but we'll wait to take the A1 out for an adventure before judging the quality of the videos it takes. As for that seeing in the dark business, the HX-A1 has a 0 Lux Night Mode for recording no-light japes. The camera itself includes an IR filter (night mode) and can be used with an infrared light source to catch that pesky red-eyed tree frog. It also features loop recording so you don't need to worry about running out of storage - after an hour the HX-A1 can be set to erase earlier scenes in two minute chunks so you can keep on filming. The Wi-Fi wearable camera can be mounted to a Multi Mount onto goggles, shoulder bags or helmets or onto a tripod using a Tripod Mount. There's plenty of optional accessories available including a handlebar mount, extended battery, twin mount for a light source, clip mount and head mount. Panasonic hasn't released any price or release date information yet but we'll update this story when it does.